Galerija12 HUB (G12HUB) is an art and technology center based in Belgrade, Serbia, and dedicated to the promotion and development of inter-media arts and performance. It provides state of the art tools for digital research and production; initiating and promoting experimentation on the borderline of arts, science and live performance. The G12HUB program structure combines exhibitions, live performances, streamed events, digital encounters, dialogues, debate, presentations and workshops with the aim of promoting cross media and trans disciplinary approaches to art production and interpretation. G12HUB works to develop collaborations with a wide range of international institutions and individuals, opening the space for exchange and exploration between the international scene and local initiatives. Through an intensive knowledge exchange program G12HUB also works to increase the production of younger generation artists and researchers. G12HUB intends to illuminate the potential of performance and inter-media collaboration in the future development of arts production that can transform our understanding of today's world and its future. Sara Kostić presents the durational piece Voice, a performance dealing with the anxiety of the 'learned'. Struggling with paths and systems that are chosen for us or by us, not always consciously or deliberately. You can't claim your body as your own because you are possessed by your body as much as you possess it. Performance is focusing onto the power of the body voice coming from within, challenging the relationship between possessing and being possessed. Speak or be silent, the choice itself is the final instance. Sara Kostić, Voice. Durational performance of two days at the III Venice International Performance Art Week 2016. Image © Claudia Popovici. I love you. I’m sorry. Please forgive me. Thank you. deals with the issues of love, taking responsibility, forgiveness and reconciliation; national and language identity and conflict as a result of the unconscious, conscienceless and unethical reference to these identities. If one would take complete responsibility for one's life, then everything one sees, hears, tastes, touches, or in any way experiences would be one's responsibility because it is in one's life. The problem would not be with our external reality, it would be with ourselves. To change our reality, we would have to change ourselves. Total Responsibility advocates that everything exists as a projection from inside the human being. Any error that a person clears in their own consciousness should be cleared for everyone. The artist pronaunces in English and Serbian four sentences/mantras, taken from the old Hawaiian practice of Ho'oponopono, while cutting the mantra into her skin on torso in Albanian with Kosovo dialect. In front of her is a sheep skin as the universal symbol of sacrifice. Ivana Ranisavljević I Love You. I'm Sorry. Please Forgive Me. Thank You. Durational performance at the III Venice International Performance Art Week 2016. Image © Claudia Popovici. Am I deals with the issue of freedom and basic human rights, defined in The Universal Declaration of Human Rights. The artist reads one by one the articles of the Declaration from a reversed mirror reflection, which is set at an angle on the table in front of her. Behind her back are four panels set on the wall, with the printed articles of the Declaration, available for reading to audience. During her reading, the artist progressively sews her lips together with a needle and a thread, until the moment she can't reads/speak anymore. 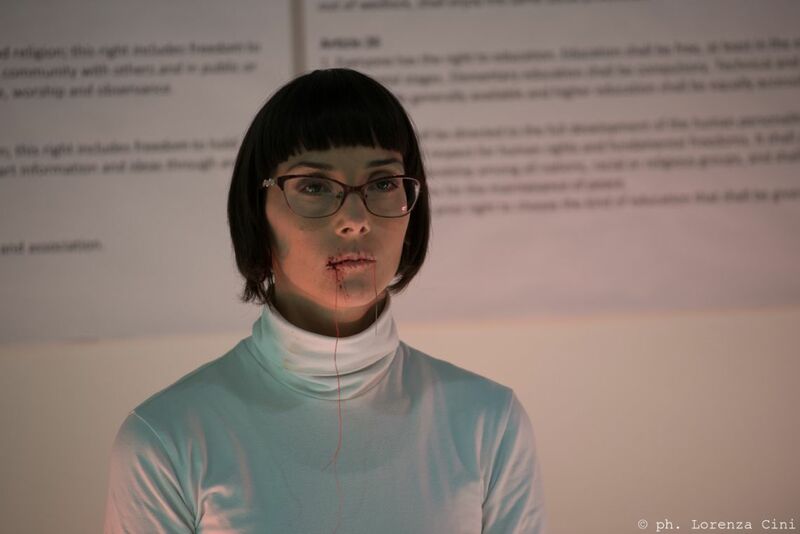 Ivana Ranisavljević, Am I. Durational performance at the III Venice International Performance Art Week 2016. Image © Lorenza Cini. • Video Conversations about New Artistic Practices of the 70s in Serbia. In a series of video interviews Raša Todosijević, Era Milivojević, Dunja Blažević, Ješa Denegri and Jasna Tijardović reflected on the period of the 70s in Belgrade. This was the period when a new artistic scene, defined by Ješa Denegri as 'New Artistic Practices', was emerging. The focus of the interviews was work within the Student Cultural Centre of Belgrade when some of the most important art projects in the second half of the 20th century in this region were developed. The following topics were initiated and discussed: classical education at the Fine Arts Academy; the liberation movement of '68; youth rebellion and awareness of their role in cultural change; the concept and foundation of the Student Cultural Centre (SKC); the influence of the Student Cultural Centre in Zagreb and its gallery programme; the influences of Italian and USA curators; the profile and structure of the SKC gallery, the first performances and site specific works; art and life; art theory and art practice; plurality of art scenes in the SKC; the art scene in the SKC; the art community outside of the SKC; life on the streets; curatorial work as applied critique; liberation of artwork and its dematerialization; revalorization of historical avant-gardes; continuity and discontinuity; the social character of conceptual art; the relationship between conceptual art and museums; the relationship between conceptual art and the art market; institutional recognition and institutional ignorance; the tacit generation; artists’ struggle with ideology; concepts which come to an end. Through conversations with artists and curators who actively contributed to the development of the new artistic climate after the students’ protests of 1968 these interviews aim to enable new insights into artistic developments of this period. This is just the first phase of the project and many more dialogues are planned with artists both from Belgrade and Novi Sad. The Project was created by Milica Pekić and Stevan Vuković in collaboration with Ana Adamović (Editor), Srđan Bajski (Sound Design) and Vladimir Slijepčević (DP). Production: Kiosk Platform for Contemporary Art with support of Ministry of Culture and Information of Republic of Serbia and Student Cultural Center, Belgrade. • Video review of Serbian contemporary performance artists. With Marina Markovic, Branko Miliskovic, Marta Jovanovic and Sanja Copic. G12 HUB. 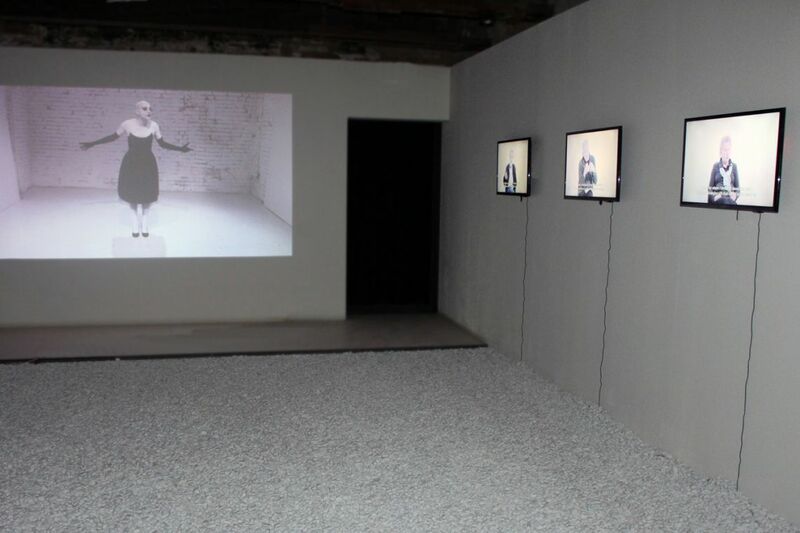 Exhibition view at the III Venice International Performance Art Week 2016. Photograph by VestAndPage.